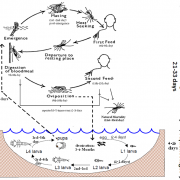 Hydrology is linked to Malaria mainly through the population dynamics of Anopheles mosquitoes. This short video explains the mechanisms of malaria transmission and how hydrology, climatology, and other factors could impact the malaria transmission potential. 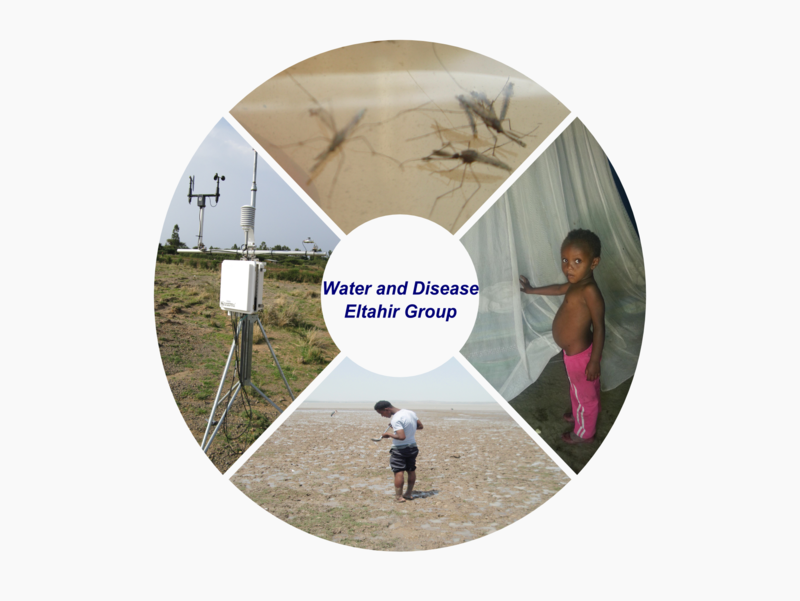 The video also introduces the field activities at Eltahir Research Group. 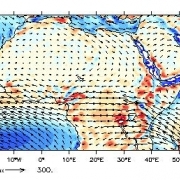 A significant fraction of the inter-annual variability in the Nile River flow is shaped by El Niño Southern Oscillation (ENSO). In this study, we investigate a similar role for the Indian Ocean sea surface temperature in shaping the inter-annual variability of the Nile river flow. We are working to better understand the regional climate of the Maritime Continent, the patchwork of islands and oceans that constitutes the archipelago portion of Southeast Asia. 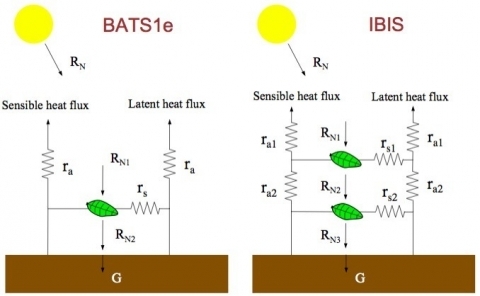 Our work focuses on processes that occur at diurnal timescales, especially radiative heating, cumulus cloud formation and convective rainfall. These processes help shape the long-term climate of the entire Maritime Continent region and provide enormous inputs of heat and moisture to the upper troposphere, with implications for global atmospheric circulations. Climate models are the main tools for predicting future climate and for creating credible future climate change scenarios. However, prior to their use to simulate future climate conditions, we need evaluate their skill in simulating the current and past climates. From agriculture losses to air travel disruption, dust storms affect millions of people every year. Moreover, research has shown that mineral aerosols (dust) have a profound effect on global and regional climate dynamics. 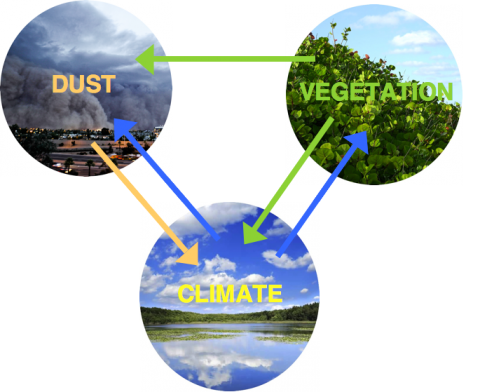 However, little is known about interactions between the surrounding natural vegetation and dust emissions. We have developed a methodology to make early warnings of malaria transmission using HYDREMATS. Early warnings of malaria transmission are an important component of malaria control, as they allow local officials to prepare for or even prevent epidemics by reallcoating limited resources including staff and medication, conducting vector control activities, and urging people at risk to take precautions to avoid insect bites. In January 1981, the The New York Times article “Down on the Farm, Higher Prices” explained the economic impacts of drought, predicting a 10%-15% increase in average US consumer food bills resulting from a lack of rainfall in 1980. Agricultural productivity is strongly correlated to soil moisture, as examined by studies such as: The Effect of Water Stress on Corn in its Various Stages [Claassen, 1995]. Neem seeds were field tested as a locally-produced, sustainable larvicide. 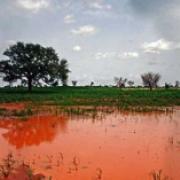 During the 2007 monsoon (June – September), we regularly applied crushed neem seeds to malaria mosquito breeding pools in Banizoumbou, Niger. We continued to monitor mosquito abundance and hydrological conditions in the same manner as in the 2005 and 2006 monsoons to assess the impact of this intervention. In addition, we monitored mosquito abundance in the nearby village Zindarou for the same three years, but for control purposes did not apply neem during the 2007 season. 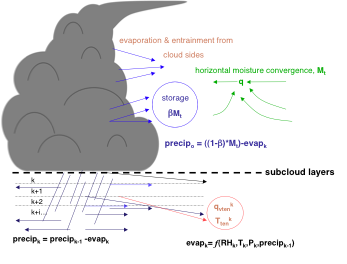 From radar studies and observations, it has been estimated that in dry environments between 20 and 50 percent of rainfall evaporates once falling from the cloudbase. When compared to observations, original simulations of RegCM3 over the Middle East contained large wet biases (on this order) in the Arabian Peninsula. 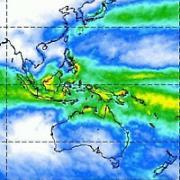 Large annual overestimation of rainfall also led to substantially higher interannual variability than observations (CRU). Prediction of impacts of interannual climate variability on malaria transmissibility in Banizoumbou. 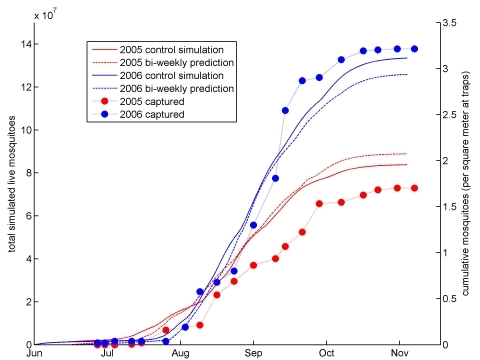 Using our mechanistic modeling approach, we have reproduced the seasonal and interannual variability in mosquito abundance between 2005 and 2006. This result is from HYDREMATS, our agent-based model coupled to a distributed hydrology model. In a recent study, Eltahir and Yeh (1999) presents a comprehensive data set on the hydrological cycle of Illinois. 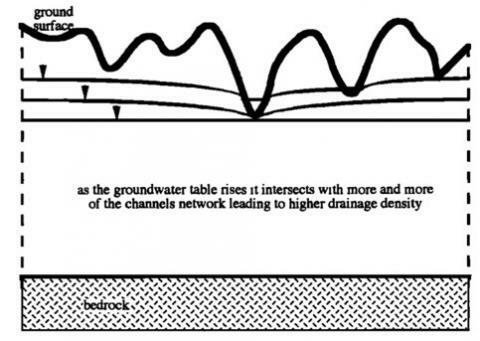 The following figure, taken from their paper, describes the propagation of hydrological floods and droughts from the atmosphere into the soil and down to the groundwater aquifers. If we focus on major events: the drought of 1988 and the flood of 1993, we can observe that the aquifer tends to amplify the drought and to dissipate the flood. The Midwest region of North America experiences significant floods and droughts during the summer season. 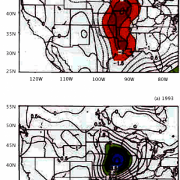 The 1988 drought and the 1993 floods are good examples for these extreme events. 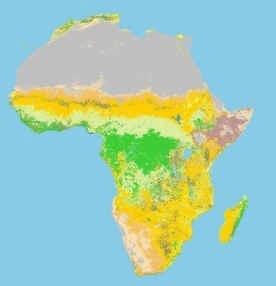 The region of West Africa has experienced significant changes in land cover during this century, ranging from deforestation near the Atlantic coast to desertification near the border with the Sahara desert. 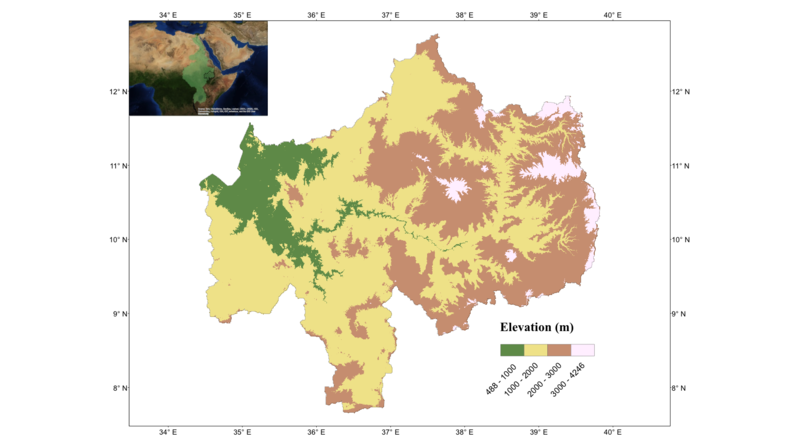 Until recently, the lead time for forecasting the Nile floods was limited to less than the hydrologic response time scale: the time period between occurrence of rainfall over the Ethiopian Plateau and occurrence of stream-flow. For the Nile basin this response time is about one month. The following forecasting table, taken from Eltahir (1996), can be used for forecasting the Nile flood conditions, with a lead time of about six months. In March 1999, most models for forecasting ENSO predict a cold SST during the summer of 1999. Using this information we can almost rule out the possibility of a low flood in the Nile, six months ahead of the flood peak time in September. Climate is known to be a strong influence on malaria incidence. But other environmental factors, such as the existence and management of a reservoir, also contribute to malaria transmission. 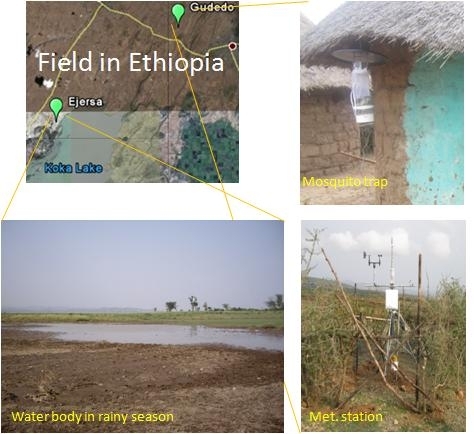 In 2011, the Eltahir Research Group launched a new project based in Ethiopia with two field sites: one adjacent to the Koka Reservoir and the other 10 km from the reservoir. 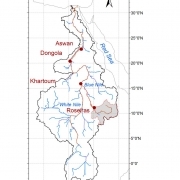 A previous study found that malaria incidence in populations living within 1 km of the Koka reservoir was nearly 20 times greater than for those living 5 to 9 km away. Due to the need for additional energy sources and irrigation water, Ethiopia is now promoting new constructions of dams and reservoirs. Therefore the goals of this research project are to investigate the impact of these environmental factors on mosquito productivity and to help inform good decision-making for reservoir management in an effort to reduce local malaria. Malaria transmission is closely tied to climate. 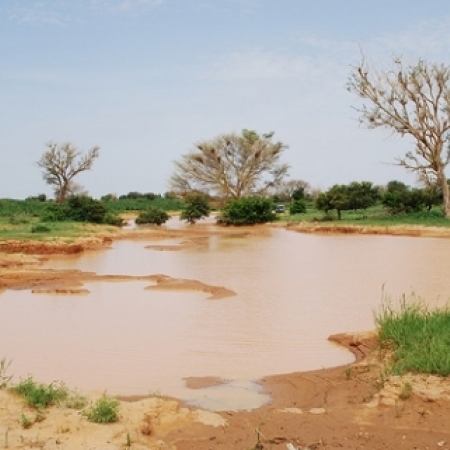 In West Africa, mosquito populations depend on the availability of water pools for breeding. The presence and persistence of these pools are tied to the region’s hydrology, as they are formed by excess rainfall and depleted by evaporation and infiltration into the ground. Temperature also plays an important role in malaria transmission, affecting the lifespan of the adult mosquito, the development rates of mosquito larvae, and the incubation period of the malaria parasite within the mosquito. In this project, we are using predictions of these climatic variables to look at how the environmental suitability for malaria transmission will change as temperatures rise and the distribution of rainfall is altered. We use HYDREMATS to simulate transmission under current and future climates and identify areas that may be especially vulnerable to increases in transmission, as well as areas where transmission is expected to decrease. 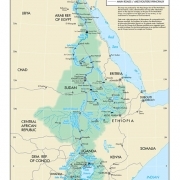 Ten countries fall within the drainage of the Nile Basin. As the nations compete for water rights, their relationships have deteriorated and the issues may escalate into conflict. The rapidly growing populations in the Nile Basin, 245 million in 1990, and projected to reach 859 million by 2025 (Wohl, 2011) may soon outstrip the water resources of the Nile. As the struggle for water continues, we investigate how we can best distribute the 84 km3 of water among competing needs like irrigation and hydropower, and nations like Sudan, Egypt and Ethiopia. High levels of uncertainty in simulating the current and past hydrological cycle of the Nile basin using general circulation models (GCMs) creates a challenge for accurately estimating climate change impacts on the Nile basin. 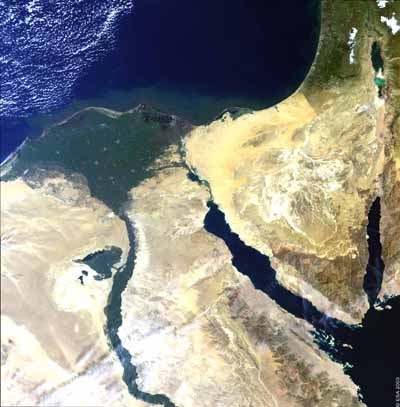 The objective of this project is to enhance our understanding of the hydroclimatology of the Nile Basin and to provide a more certain estimate of the climate change impacts on the hydrological cycle of the Nile basin. * Smaller scale Impacts — Archaeological sites, population resettlement, affects on public health due to water-borne diseases introduced by the new reservoir. The aim of this pilot study is on the one hand to understand the different natural factors and study the human activities that influence on the ecosystem in Dhofar, as well as to develop strategies to prevent and combat desertification in the region. As a first step we aim to understand the natural factors that shape the climate system Dhofar. For this part of the study we do not take into account the human influence on the system. 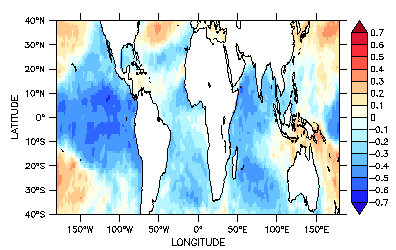 We analyzed data on the large scale climate, like sea surface temperature (SST), wind, pressure. We also studied local data from climate stations in Dhofar and along the Coast to the Arabian Sea. An atmospheric model was set up for the region. The control runs are conducted at this point. Once the model is successful in representing the climate in Dhofar, it will be used to study the influence of large-scale climate on the Dhofar ecosystem. For example we will model the influence of the observed increase in Sea Surface Temperature of the Arabian Sea on the precipitation of Dhofar. We also conducted an extensive literature research. 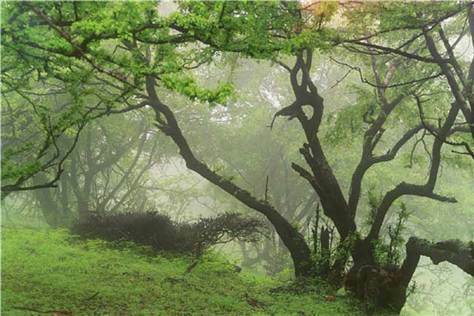 Two excerpts of this research are included to this web-page: (1) a review about the climate in Dhofar and in Oman in general and (2) a review about ecosystems that are influenced by clouds (cloud forests). As a second step we will take into account the influence of human activity on the system and finally we will investigate how the system can be managed in a way that prevents desertification and helps to conserve and probably reestablish the unique ecosystem of Dhofar. Hydrological and climatological determinants of African anopheline habitat Within the semi-arid Sahel zone of Africa, serious malaria epidemics arise as a result of the annual wet season. We are studying the environmental determinants of malaria outbreak occurrence in this region with the aid of numerical modeling techniques. We are involved in an inter-disciplinary study to investigate the dependence of mosquito breeding and infection rates on factors such as surface water pooling which is the result of various hydroclimatological variables. 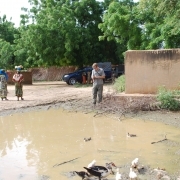 In a unique approach, individual mosquitoes in a small study area in Niger will be modeled numerically in a simulation coupled with a small-scale hydrology model. Model input will include satellite-acquired remotely sensed data for vegetation, soil moisture and topography. With results validated by field investigations, variation in mosquito abundance and infection rates will be simulated. This numerical modeling tool will shed light on dynamics of outbreak occurrence and will help the targeting of intervention efforts. Weather and climate affect almost every facet of human activity, which makes the pursuit to understand the hydrologic and atmospheric systems of the Earth, as well as the effects of anthropogenic activities on these systems, one of the most important areas of scientific research today. One approach used to gain a better understanding of local land- atmosphere processes is regional modeling. Though limited in predictive ability by the use of boundary conditions and prescribed sea surface temperatures (SSTs), regional models are able to resolve important processes at sub-general circulation model (GCM) resolutions. Mosquitoes can carry many viral diseases, such as dengue fever, West Nile virus and Rift Valley fever. Dengue is transmitted mainly by Aedes species in the tropics. West Nile virus is transmitted by Culex species. In the last decade, there has been an increase in the frequency and intensity of mosquito epidemics. Both climate and societal factors are important for explaining these changes in epidemics. Because mosquito species occupy different ecological niches, they exhibit differential sensitivity to climate change. This project aims to improve forecasts of mosquito-borne disease epidemics and aid in developing the most appropriate management strategies for a given context.